There's nothing more important than mending original documents like birth certificates, final essays, and special photos. One original deserves another. Scotch® Magic™ Tape is the original invisible matte-finish tape preferred by homes, schools and home offices. Why? Because it works like magic: It's invisible! Gives you a strong, secure, permanent seal using trusted 3M adhesive technology. 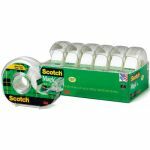 And with our easy-to-use Scotch® Tape dispenser (included), Scotch® Magic™ Tape rolls out smoothly, cuts evenly-with no time, energy or tape wasted. Magically mend the many rips and tears of life--securely, permanently, and invisibly.